New landscape from Martha’s Vineyard underway. 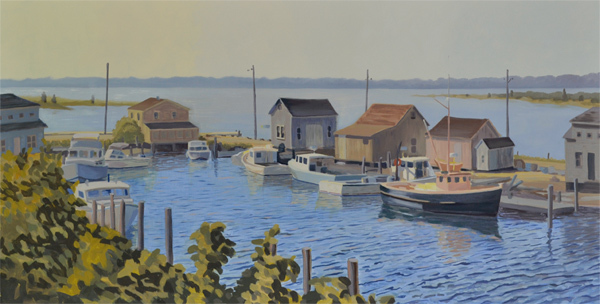 On the easel right now is a new landscape from Martha’s Vineyard. This fishing village is in Menemsha and it is a morning view overlooking the fishing boats and shacks that line the inlet. I’m still working on the green bushes on the lower left and the finishing up final details of the boats and water. This location is known for it’s sunsets but I like the morning light where the details of the shacks and boats can be seen. For more info on this area follow this link http://en.wikipedia.org/wiki/Menemsha,_Massachusetts. Check back to see how this oil painting looks when it is finished. Meanwhile, I will be posting a tutorial on how to paint water with images showing each step. That will be in a few days so if you would like to automatically receive that blog update fill out the blog subscription form on the right side of the blog page and it will be emailed to you as soon it is posted. Thanks for reading and please use any of the social media icons below to forward this to anyone who may like this painting or this painting blog.